The Bible warns of a future time of trouble coming when the whole of the existing people on earth at that time will be thrown into such a calamity and violent chaotic condition that they all would seek to die but will not be able to escape it. A time when the Lord said He would have to return and cut the season short because if he did not everything would ultimately be destroyed. This future time will be characterised by bloodshed and violence such as the world has never witnessed or seen prior to it or will ever see after it. Throughout the entire volume of Holy Scripture continual warnings are given of the severity and total absence of decency and human dignity at this time. It is a conflict to end all conflicts a final confrontation of good and evil and everything dark against everything light. That showdown or ultimate contest will ignite the passions of all creatures on this earth and beneath it, as the scripture mentions that at this time the gates of Hades, hell itself will open up and every abominable evil spirit and thing buried in that place over centuries will come forth to destroy and deceive the people on earth. This major confrontation, never to be repeated again, between God and Satan will affect the entire universe, and this conflict has been brewing since time began. It actually originated and began way back before time, when the universe was created. The battle began when the instigator of it, Satan and his rebellious minions tried to seize control of Gods authority and take his kingdom. This revolt in heaven has continued on down through ancient history till today. It began where Ezekiel the old Testament prophet describes in chapter 28 of his recorded writings how Satan took a host of angels and led them in a revolt, impacting earth and Gods entire created universe. This recorded message of Ezekiel aligns in truth with another prophet Isaiah in chapter 14 in his record, written in the Holy Scriptures where it informs us that Satan or Lucifer the Protos, (Greek for chief) archangel, resulting from his rebellious insurrection, was thrown out from Gods ruling domain in the highest heavens. Satan became Gods arch enemy and from then on creations arch enemy also, and his dwelling place from that moment on was from the second heaven or in the created arena of space amoungst the stars, no longer permitted in the highest or third heaven that the Apostle Paul refers to in the New testament as being where God lives and reigns. The scripture clearly teaches, that there are three heavens, the third already mentioned above as, the place where God abides, the second heaven, where the stars of heaven abide or more definitively outer space as we would call it, and the first being the atmosphere on this physical earth where we dwell but more importantly where the birds dwell and abide. When Satan fell he was no longer permitted in Gods dwelling place so wast cast out to lower or second inferior heaven where the stars and planets dwell. The only access Satan has to God, is when he comes in accusation of each of us as Gods children, you and I, when we nave sinned, to accuse us before the Lord as mentioned in the Book of Job and in the Book of Revelation as the accuser of the brethren. The Gospels state, when Jesus was on earth, He sent out seventy disciples two by two, to take the message of salvation to the regions round about, he told them to preach that the kingdom of heaven was now open and accessible for all. On returning from their mission, Jesus stated to them, after hearing their excitement at experiencing Gods power over demons, “I also beheld Satan as lightening fall from heaven” Jesus was describing what he had witnessed in the spirit realm, of the first heaven, our invisible atmosphere, Satan as a bolt of lightening fell from the second heaven to the first heaven. Lucifer was at that moment relegated to an even more inferior position in creation than before. At that time Satan had been demoted from the heights amongst the stars, to the lessor observance of the heaven of this world alone. As the apostle Paul noted he is now a principality of the air, a spiritual ruler of darkness. His position was no longer in the created universe as such, but just this world. From that time on in scripture, it is rather obvious that Satan’s realm of influence and power became limited in a geographical sense, but Satan’s wickedness against creation intensified. 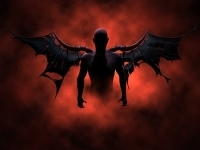 From that statement of Jesus forward, the epistles and scripture subsequently refer to Satan as being called the Prince of the Power of the air, the god of this world. Satan has become a little, god with diminished power trying to influence creation, from the atmosphere above. He now is simply a spirit of darkness positioned as a principality, attempting to govern by evil from a heavenly or high place. He tries to influence and control mans affairs in this physical world from that higher sphere. His demotion and consequential down grading or lessening of power now has motivated his effort and haste, realising his limited opportunity is shrinking by the year. This realisation in his drive for supremacy has fanned the fires of demonic rebellion to a state of frenzy, whereby total all out war and confrontation is his only option. Tensions are driving the forces of evil to an impending crisis moment in history where prophecy warns, that brother will be against brother a father shall betray his son and the son his father etc.. No human relationship will be considered sacred any more and love and loyalty will be sacrificed for the sake of personal survival. Godliness, truth and justice will not survive this period of time without the Spirit of The Lord to keep men’s hearts pure. It will be the ultimate battle for control, an all out grab for power, the war to end all wars. Armageddon as it is called. Satan will declare himself God of this world and will oppose everyone that loves and serves God. This war will involve both physical and spiritual worlds, and unless the Lord intervenes because of its intensity and ugliness, few will survive. Perdition is another name for hell, this evil being in a human form will deceive many by his enticing flattery, Daniel the Prophet predicts. This son of hell will deceive them into believing he is God and because they do not have a love for the truth in Gods Word, they will believe and be captivated by this lie. God himself will give them over to those lies as they will reject Biblical truth. The book of Revelation predicts, Satan in this human form will demand physical worship and totalitarian submission by way of a system he will impose and force upon all men, young and old, rich and poor, bond and free alike. To bow down and worship him and he will do it by way of a monetary system. All prophetic reference to this future time reveals a time of complete destruction and devastation, a time described as the total desecration of all good, "THE ABOMINATION OF DESOLATION". A great observation over history is that every time God elevated his people, the enemies of his people had to retreat and as a consequence, conceded territory and this is the same. As Gods church and his saints rise to a new level of authority out from their comfort zone to a new one, the Devil and his host of followers have to concede ground and retreat from theirs. If we do not move forward taking land the Devil will, but when we move forward possessing territory he vacates it. The prophetic scriptures of Jesus and his church taking back creation that the devil has tried to steel and dominate, show the devil will consistently lose ground, until it becomes an all out war against Christ and His church and no one is exempt. It will be a conflict to end all conflicts an all out war of extreme hatred in which Satan will attempt to seize all creation, claiming it as his own. The Bible also warns us that at that time Satan will come down upon earth in the form of this man of sin and evil, whose agenda is the total control and ownership and the utter destruction of any one and anything that gets in his way. Satan is well aware of the degree of intensity approaching and is totally conceited in his conviction that he can pull it off. The time allotted to man has been what he needed to gradually foment mankind and society so that he can at least have a base or premise to justify his final assault on Gods creation. He has waited to this last time and amassed not only his hordes. but a majority of human minds and resources along with advanced technologies to accomplish his end objective, and is near to exercising that agenda. He is totally aware of its consequences should he fail as scripture says in the Revelation that he knows there will be a short strategic window of opportunity for his wickedness, "Satan knows that he has but a short time and will come down upon earth in great wrath to deceive the nations" His strategy has been to accumulate time, people, nations, cultures, religions, arts, politics and ultimately the passions of human greed and power. Once these are all under his dominion, then he will attempt his coup de Tate, his arrogant conceit convinces him he can carry it off, with absolutely no concern for the millions that will die in the process. What you sow you reap and the deception he inflicted on man will ultimately blind himself and that deception and delusion will culminate in his defeat and total destruction, but for one more final attempt after a thousand years he will attempt it again, and then his usurpation will end for ever. Amen and Amen.